This easy strawberries Romanoff recipe is a classic Russian-American dessert served by Michael Romanoff, a self-proclaimed member of Russian royalty, at his namesake restaurant (now closed) in Beverly Hills. Be careful when folding the marinated fruit into the ice cream and whipped cream mixture lest the fruit juices bleed and turn the cream a pastel pink color. This is an easy dessert to whip up at the last minute that's suitable for the most elegant party. Just don't serve it to the kids unless theirs is an alcohol-free version. Romanoff's real name was Harry F. Gerguson, born Hershel Geguzin in Lithuania. He was a restaurateur with a sketchy past who knocked his customers' socks off with this desserts, especially when fresh California strawberries were in season. Lest one think ill of Michael Romanoff, his restaurant did invent noodles Romanoff, a creamy dish of egg noodles enrobed in a creamy Parmesan cheese sauce. In a large bowl, combine strawberry and orange liqueurs, cognac and lemon juice and up to 2 tablespoons dark brown sugar if berries are not sweet. Reserve 8 whole strawberries for garnish. Hull the remaining strawberries and cut them in half. Marinate the halves in the liqueur mixture at room temperature for about 15 minutes. Place a small scoop of the remaining 1 pint of vanilla ice cream in the bottom of 8 large stemmed glasses. Fill the glasses with the strawberry ice cream and whipped cream mixture. Garnish with one of the reserved whole strawberries. Sprinkle with brown sugar or confectioners' sugar, if desired. Serve immediately. While it is speculated the dessert was created in California, there are French and Russian versions. In fact, Escoffier is credited with creating it when he was the chef at the Carlton Hotel in London. In France, it is made with Curacao, whipped cream, orange juice, vanilla, and superfine sugar but no ice cream. 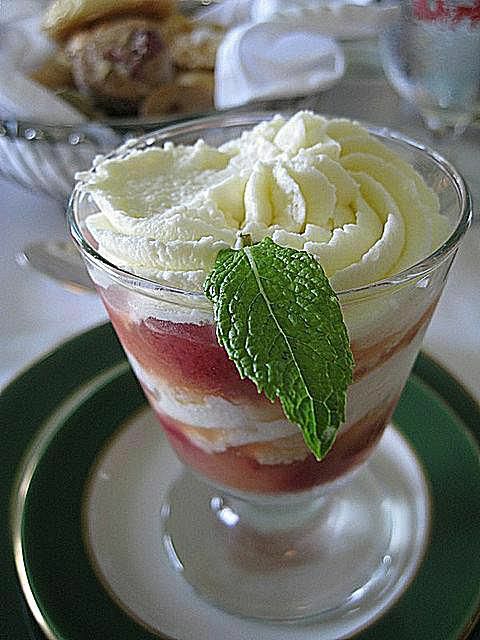 In Russia, strawberries Romanoff is made with Cointreau or orange juice, sugar, whipped cream, vanilla, and sour cream and, again, no ice cream. It appears the use of vanilla ice cream is a distinctly American invention.